Why is there so much evidence that small and medium enterprises (SMEs) have not yet taken advantage of trade agreements, one of the most important tools that provides business opportunities and generates growth? Not only Vietnamese businesses, but also those from other countries have difficulty taking full advantage of opportunities from trade agreements. Ms. Karen Reddington, President of FedEx Asia Pacific, said that in some markets like Singapore, there is a widespread recognition that SMEs are having difficulty in reaping benefits in commercial transactions. In Australia, a government poll took place because of concerns that SMEs did not seize access to trade agreements. Further in Europe, research indicates that regulatory complexity or the lack of information will make companies lose billions of euros into irrational customs responsibilities. This is not a new issue. The study by Hongkong and Shanghai Banking Corporation (HSBC) into 800 companies across Asia evaluated trade agreements and found that only about one in five businesses took advantage of those deals. "We understand that it is still too difficult to explain or navigate agreements to achieve the desired benefits, especially for SMEs who are not experienced in international trade," said Ms. Karen Reddington. The cause pointed out by Ms. Karen Reddington is that SMEs often lack human resources and expertise to navigate complex trade rules and do not know how to reap the benefits of trade agreements. The textile and garment industry is one of the leading industries in capturing opportunities from trade agreements. Mr. 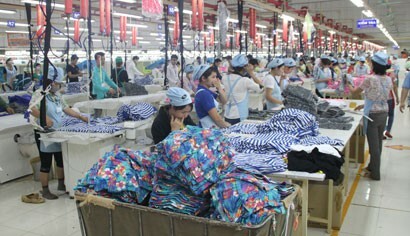 Le Tien Truong, General Director of Vietnam Textile and Garment Group (Vinatex) said that enterprises cannot wait until the agreement comes into effect, but must start preparing for it immediately. Vinatex's member businesses have directly promoted trade, met customers, introduced products, negotiated prices, and signed contracts with the Canadian and Australian markets to increase exports to countries that are members of the Comprehensive and Progressive Agreement for Trans-Pacific Partnership (CPTPP). Unlike normal practices, Vinatex hired a 5-star hotel meeting room in Toronto, Canada, to organize its own fair on a small scale but very effective. In Canada, it has been able to initiate business contacts with more than 70 potential customers in such a way. Vinatex's member businesses have focused on targeted products. For example, Hanoi Textile and Garment Joint Stock Corporation (Hanosimex) has only made polo shirts and winter clothes while Garment 10 has focused on shirts. Phong Phu Joint Stock Company has only negotiated trades about jeans, denim suits. With this approach, Vinatex will focus its own list of markets, aiming at 10% turnover from CPTPP market. Meanwhile 40-50% of its turnover still comes from the U.S, EU (18-20%), Japan (20%). Textile and garment industry aims to export US$40 billion in 2019, striving to increase the industry's revenue by 5-7%, profit by 12% compared to 2018. Mr. Truong Dinh Hoe, Secretary General of Vietnam Association of Seafood Exporters and Producers (VASEP), said that opportunities for seafood industry were huge. It is expected that by 2020, seafood consumption will reach about 98.6 million tons in developing countries and 29.2 million tons in developed countries, while its supply is only 78.6 million tons. This will be a great opportunity for Vietnam's fisheries industry, if it meets the quality criteria of the world market. According to Ms. Phan Thi Thanh Xuan, Vice President, General Secretary of Vietnam Leather, Footwear and Handbag Association, companies have to build a strategy to reach the market, try to penetrate the global value chain, so they should be focusing on investment in raw materials, gradually reducing import proportion. Currently, many businesses have been more active in design, research and development of new products. In 2019, the leather, footwear and handbag industries set a target to export about US$21.5 billion, an increase of US$2 billion compared to the results of 2018. In fact, in recent years, many businesses have been engaged in intensive processing of agricultural products. Some large enterprises, such as Vinacafe, Trung Nguyen, Me Trang or An Thai have been focusing on launching instant coffee production projects aiming at exporting deeply processed products. This can include "coffee 2 in 1", "coffee 3 in 1" products. In addition, businesses have also diversified products such as coffee tablets, coffee bags. In addition to exports, the use of coffee products, which have been deeply processed right from the domestic market, is a plan to reduce the pressure on exports in accordance to the current market. Enterprise can hardly act "single-handedly"
Vietnamese financial expert Can Van Luc said that CPTPP was a game that required more equality and transparency. He advised Vietnamese enterprises to approach and learn more about the terms of CPTPP, to assess the opportunities and challenges to find appropriate strategies and solutions. Ms. Karen Reddington said that in a trade bloc, member businesses are increasingly having many choices. For example, SMEs in different CPTPP markets can cooperate to exploit a completely different third market - this will save time and money by gathering resources to work towards a common goal. SMEs should work together with business agencies, governments or small and medium business organizations - or work with partners like FedEx to better understand their starting point for quick success. In addition, businesses need to receive advice for the right direction and technology tools are also very important. “We also support automation in the shipping process, as this may minimize customs procedures for cross-border shipments, working with regional customs authorities to expand customs clearance for e-commerce,” said Ms. Karen Reddington. From the beginning of the year to March 15, 2019, the total export value of the country reached US$47.05 billion, up 5.4% over the same period in 2018. It is expected that export turnover in 2019 can reach US$258 billion.